Brick-and-mortar retail had a really bad year, with thousands of major chains shutting down stores. But Amazon, the company that many people blame for the retail apocalypse has been more eager than ever to build up its retail presence. As the world nervously awaits Jeff Bezos’ next big move, a prominent analyst predicts that Amazon will take over Target this year. Gene Munster is a market analyst and founder of Loup Ventures. Munster is known for his decade-long bullishness on Apple’s stock. He tends to be right that it’ll go up, but he invariably overshoots by how much. He’s also the man you can thank for years of rumors that Apple is coming out with its own TV and most recently he’s been predicting an Apple car is coming in 2021. Still, his early optimism about the iPhone means the markets listen to him. And after he dropped his list of tech predictions for 2018 on Monday, Target’s stock is rising based on his belief that Amazon could swoop in and purchase the retail giant. Target is the ideal offline partner for Amazon for two reasons, shared demographic and manageable but comprehensive store count. As for the demographic, Target’s focus on mom’s [sic] is central to Amazon’s approach to win wallet share. Amazon has, over the years, aggressively pursued mom’s through promotions around Prime along with loading Prime Video with kid-friendly content. As for retail stores, Amazon’s acquisition of Whole Foods 470 stores along with testing of the Amazon Go retail concept is evidence that Amazon see’s the future of retail as a combination of mostly online and some offline. As for the antitrust hurdles that Amazon could face, Munster thinks that regulators will be forced to approve the deal once they review the numbers. The only competitor that truly gives Amazon any competition is Walmart with its 11,695 locations and $315 billion in U.S. sales, according to Munster. He says a combined Amazon and Target would have about 2,300 locations and about $176 billion in U.S. revenue based on figures from 2017. Of course, if Amazon bought target it would be looking to increase those figures significantly. Munster suggests that Amazon would pay around $41 billion for Target with a 15 percent premium on its market cap. That’s only about 8 percent of Amazon’s current market cap. Does Munster’s theory make sense? It does to some degree. Target’s stock has mostly been on a downward trajectory since 2015. It hit a five-year low this summer before recovering to finish out the year almost exactly as it began. A restructuring plan has Target’s CEO speaking positively about the future, but it’s not hard to imagine the retailer seeing Amazon’s deep pockets as a guaranteed route to survival. For Amazon, big ambitious moves are necessary to really compete with Walmart. It has the advantage in the online space and innovative initiatives, but Walmart has begun making startup acquisitions and exploring cashier-free stores just like Amazon. Walmart’s push into selling groceries in 1988 is considered to be the biggest reason for its dominance. Groceries are a low-margin industry, but when households do their grocery shopping at a location that has everything, they tend to pick up everything they need at that location. Earlier this year, The Street reported that food sales account for about 20 percent of Target’s business and suggested that one way to improve its grocery business would be to outsource it to Whole Foods in the same way that it’s outsourced its drug business to CVS. As we all know, Amazon now owns Whole Foods. Speaking of CVS, rumors began to fly in October that Amazon was looking to pursue a partnership with the pharmacy chain similar to the one Target already has set up. The fact is there are only a few major retail acquisitions that would make sense for Amazon in the new year. Whole Foods gets it some brick and mortar infrastructure and entrance to the grocery business. But it needs big warehouse spaces to compete with Walmart. Of the top retailers in the US, Target and Costco would be the most logical options. But Costco’s stock has been healthy for decades, and it only has 741 locations in the US. 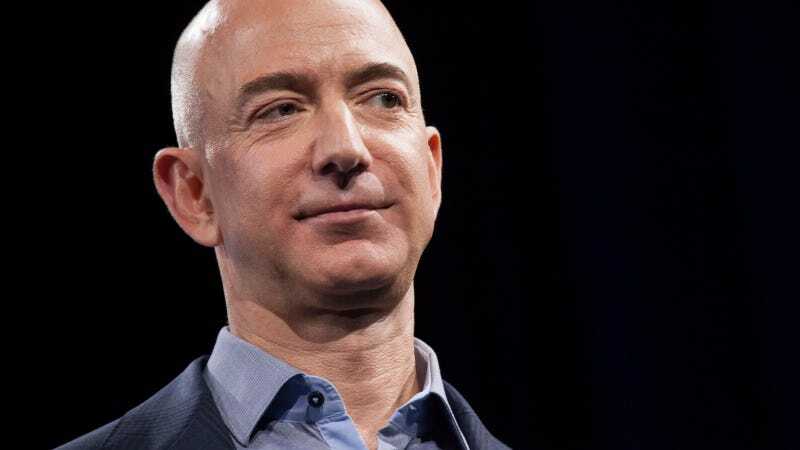 Of course, Amazon would have to make it past the Trump administration’s review of a Target acquisition, and Trump is no fan of Bezos and his newspaper The Washington Post. As recently as last week, the President went on a nonsensical rant about Amazon killing the Post Office... or something. Amazon could always throw a curve ball as it attempts to gobble up every industry in its path. Last month, CFRA bank analyst Ken Leon predicted that it’ll purchase a small or mid-size bank. At a time when trust in the tech industry is low, that move might (bafflingly) draw less attention from regulators. No matter what, in a few years time, we’ll all work for, buy our goods from, and cash our checks with Amazon. Hail Bezos.